The Green Valley Pecan Co. plant, on East Sahuarita Road, will be the starting point for a 5K run on April 16 that will benefit the Sahuarita Unified School District. 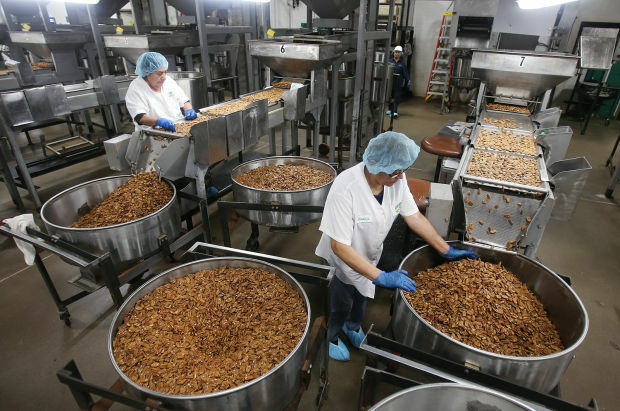 Increased interest in tree nuts as a healthy food and strong demand from China have spurred pecan production in Arizona. Arizona’s 2013 pecan production was an estimated 22.5 million utilized pounds, up 13 percent from 2012 and 22 percent higher than 2011, according to a recent report by the U.S. Department of Agriculture. Arizona is the nation’s fourth-largest pecan producer, with about 7 percent of the market share in 2011, the most recent figures available. Arizona growers received $1.90 per pound for their pecans in 2013, compared with $1.60 in 2012 and $2.80 in 2011. The value of utilized Arizona production totaled $42.8 million in 2013, up 34 percent from 2012 but 17 percent below 2011 as supply caught up with demand. Nationwide, utilized pecan production in 2013 fell 12 percent to 266.3 million pounds, while the crop’s value decreased 3 percent to $460 million, the USDA said. Sahuarita-based Farmers Investment Co., or FICO, is the state’s biggest pecan producer and added plantings in Arizona and in Georgia in recent years to make it the biggest in the world, company Vice President Bruce Caris said. Demand has been driven by exports to China that gained momentum about eight years ago, and by publicity about tree nuts as a healthy food choice, Caris said. “There’s been a lot of health studies released about the good fats in pecans, which are similar to olive oil, and in tree nuts in general,” he said. Much of the added Arizona pecan acreage has been in the San Simon area in Cochise County near the New Mexico border, Caris said, noting that FICO is among several growers that have added orchards there. While Caris said the company does not release production figures, FICO has more than 6,000 acres of pecans, including about 5,000 in the Green Valley-Sahuarita area, and nearly 1,000 in Georgia, though not all bear nuts yet. There are about 13,500 acres of producing pecan trees planted in Arizona, plus more than 6,000 acres of trees not yet bearing nuts, he said, citing USDA figures. It takes eight to 10 years for a pecan tree to start producing a profitable nut crop, Caris said, but the new plantings will drive production for years. “Because a lot of plantings have gone in, you’re going to see an increase in production almost every year for the next eight to 10 years in Arizona,” Caris said. Arizona’s crop is harvested in December and January. Contact Assistant Business Editor David Wichner at dwichner@tucson.com or 573-4181. National Pecan buys several tracts of orchards for $39.5 million. Thousands of acres of trees added in the past decade have started to boost production, but unfolding trade war rattles industry.